"This is as complete a study that has ever been done on product forecasting. For the first time, there is a place to go to discover the issues and nuances of demand management." Mike Campbell, President and CEO, Demand Management, Inc.
Demand Management Best Practices outlines an effective demand management model process tied to an integrated business process that will give your organization a competitive edge. The book helps you effectively respond to ever-increasing expectations for improved supplier delivery performance, product availability, and responsiveness and ongoing pressure from shareholders and stock market analysts to produce promised sales revenue and profit margins. It presents solutions for improving overall business performance for the end-to-end supply chain, shows you where to focus your time and attention to improve demand management processes, and discusses what results to expect. The authors provide insights on how to apply best practices in developing a forecast and demand plan, reducing uncertainty of demand, reaching consensus internally, and collaborating with customers and suppliers within the supply chain. --Presents the fundamentals for developing more reliable forecasts and schedules and shows how to build successful relationships and skills needed for collaborative forecasting and scheduling. --Demonstrates how an effective demand management process contributes to sales revenue growth, lower inventories, increased profit margins and defines what is reasonable to expect from the process. --Addresses technology, the human quotient, and common decision making elements of demand management that are often overlooked, under-utilized or over-blown and puts them in proper perspective. 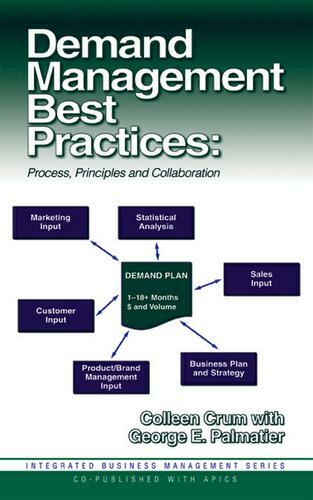 --Includes case examples to illustrate the concepts, principles and best practices of demand management and presents scenarios at the end of each chapter to spur further thought and provide insight on how to apply these principles and best practices. --Provides answers for frequently asked questions and complex issues and tackles the myths of forecasting and demand planning. Colleen Crum, a leading consultant with Oliver Wight, has helped companies implement sales and operations planning and demand management for many years. She is an experienced editor and author and has also developed teaching curricula on forecasting and demand management. Ms. Crum is a sought after speaker and active member of APICS and numerous other leading associations. George Palmatier, a leading consultant with Oliver Wight, was one of the early pioneers in the development and evolution of the sales and operations planning process. This veteran, with more than 30 years experience, was a major contributor to the first book on sales and operations planning entitled Orchestrating Success. He was also lead author of the ground breaking best-selling book on demand management entitled The Marketing Edge. Oliver Wight is recognized as the leading manufacturing consulting firm in the world. Many of the previous best-selling books developed by this firm are now considered classic works in the field.